The crows kept zipping toward it. 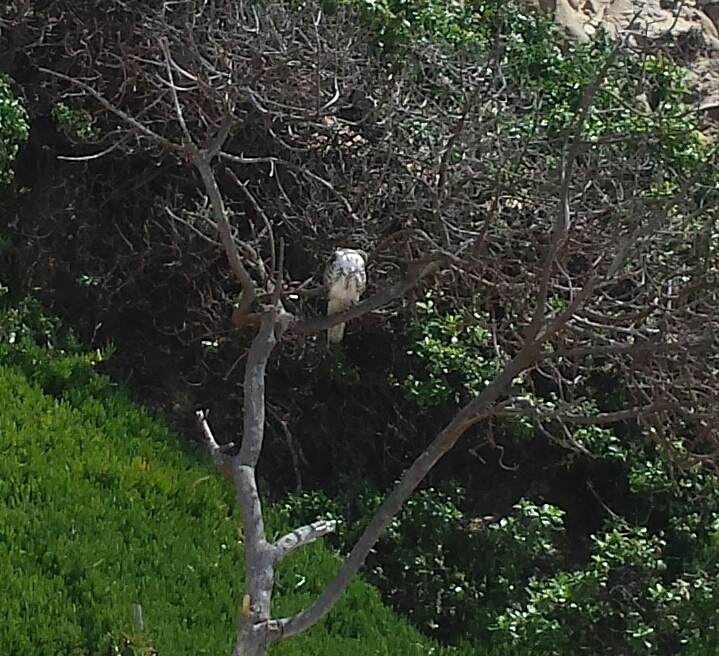 It eventually moved to another tree further along the cliffs, then disappeared. Several people stopped to watch but none of us wanted to disturb it, so we didn’t get any closer. This is a crop of my camera phone photo — we were perhaps 100 feet away. It seemed a huge bird, and rather startlingly white, especially compared to the gleaming black crows. They were much smaller and yet seemingly fearless in their aggression. Sigh. Territorial instincts abound. This is in huge (as it were) contrast to the nest of hummingbirds in the tree that overhangs the air conditioning unit in our small yard. There appear to be two chicks and a very protective and vocal mother. She had a snit-fit, righteously so, when we turned on the air conditioner, which shook her tree considerably. I guess we are going to try to do without A/C until the chicks fly the nest. She was also very unhappy when I swept the patio below her darling 2″ cup-shaped nest. Hawks, crows, gulls, godwits, pelicans, mourning doves, and hummingbirds. Heard/saw them all today!